Sometimes it takes efforts to recall a memory even though of a significant nature. Especially in the case when rushing flow of endless stimulus, new experiences and all sorts of happenings are in full stream through a strikingly active stage of our life. Therefore, it happens that a few good hours of activity spent outside, within the wise and calming company of cypress trees, might easily sneak out since being registered ‘off’ by the brain as a state of sweet idleness. 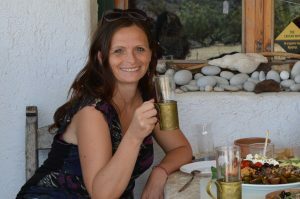 The article was originally written for and published in the issue 2016/4 of Aromatika Magazine, an online publication in Hungary to support holistic living, the practice and professional education of aromatherapy, phytotherapy, naturopathy and related subjects. My special thanks and gratitude goes to Gergely Hollódi, editor-in-chief of this beautifully constructed aromatherapy periodical for his always encouraging support. Hope you enjoy the English version in this post. The original copy of the electronic magazine in Hungarian is available for download from the website of Aromatika Magazine. In order to evoke memories, I invite my beloved collection of aromatherapy card sets. Jennifer Peace Rhind describes cypress (Cupressus sempervirens) as a supporter of managing transition, promoting inner strength and courage. 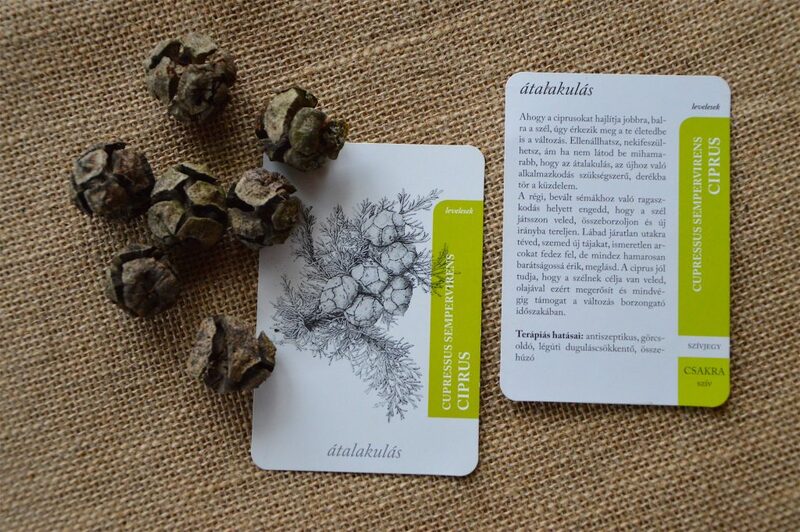 Likewise, the cypress of the beautiful Personal Scent Card series from Aroma Botanica comes to help in challenging times of transformation. 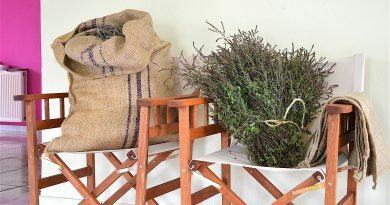 One cannot miss the olive harvest on the sunny November days in Crete. However, only few would fill up the harvest calendar with such a variety that lists olives for Tuesday, myrtle for Wednesday, and then followed by cypress on Thursday. 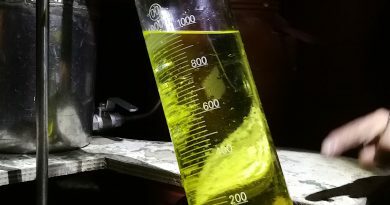 You can also read my article on the myrtle harvest (see “The Age of Innocence: the way of myrtle from harvest to distillation” originally featured at Aromatika Magazin 2015/4. ), now I would like to share with you some of my experiences around cypress. In a while, we are driving slowly, leisurely on the winding serpentine road to the rocky mountains at around 1000 meters. It is midday when we arrive at our destination, a quiet place with only some mild wind and birds singing… bright sunshine touching the beautiful landscape where cypress trees are majestically, almost hand-in-hand, arm-in-arm, extend towards each other. 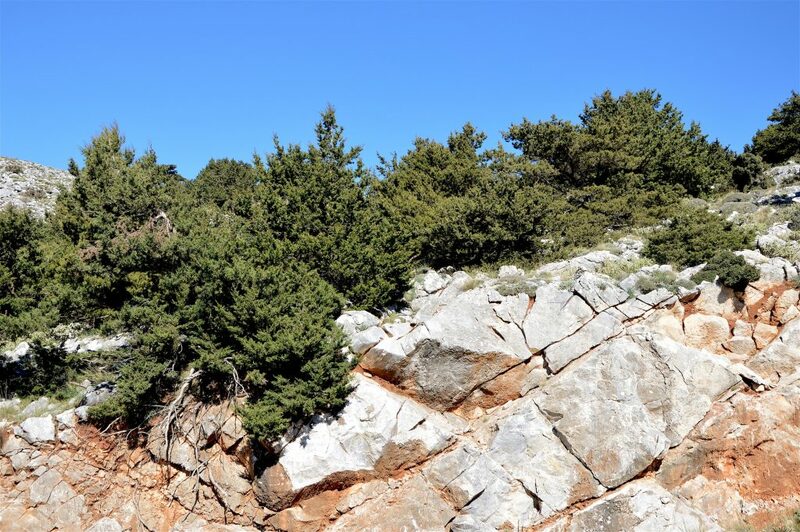 These coniferous evergreen trees belong to the cypress family Cupressaceae, and are also endemic to Crete. As a speciality, some natural populations of C. sempervirens var horizontalis still exist here and are found in these mountainous regions. 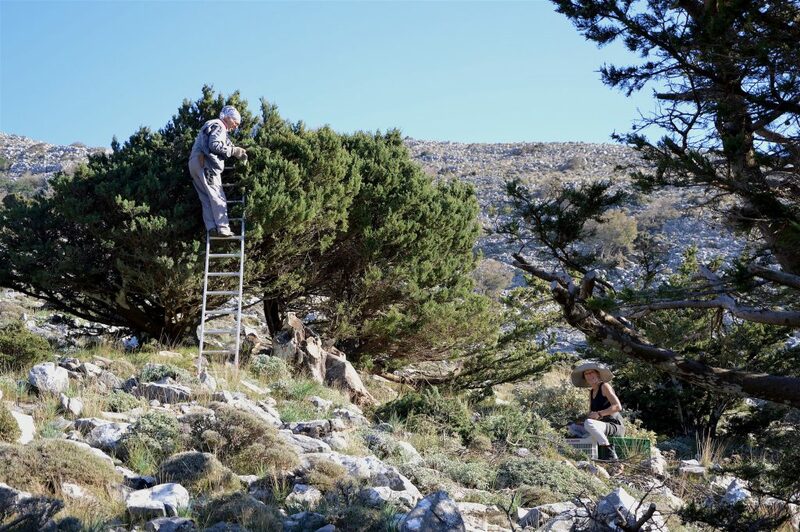 There is only a small challenge in our cyprus collection, the relatively steep and rocky area where we walk carefully getting around colourful shrubs of various aromatic plants. It is a way up where we carry our tools, a ladder, and many crates – at this time running empty, letting us enjoy our path and fill ourselves up with the blessings of this wonderful environment. Slightly similar as in the myrtle collection, the work is carried out in two steps. First the trees are pruned, following their needs and natural shape. By the help of a hand saw, the bigger branches get cut and support to their further healthy grow. Non-destructive wildcrafting of wild plants is one of the most important practicable activity for a sustainable environment since it has not only a theoretical relevance, but brings academic talk to practical walk. 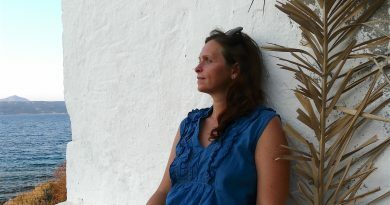 As Janina sums it up in her recent lecture at Botanica 2016: “Wild crafters can make an important contribution towards conservation of plant habitats, species & ecosystem diversity.” In this gentle approach – just like in any human relations – important to look at our relationship, our communication and our interaction with the plants, which can all be very well observed in the cooperation with these cypress populations now. In the second phase of the work, our human presence is somewhat even more near, intimate, calm and supportive. 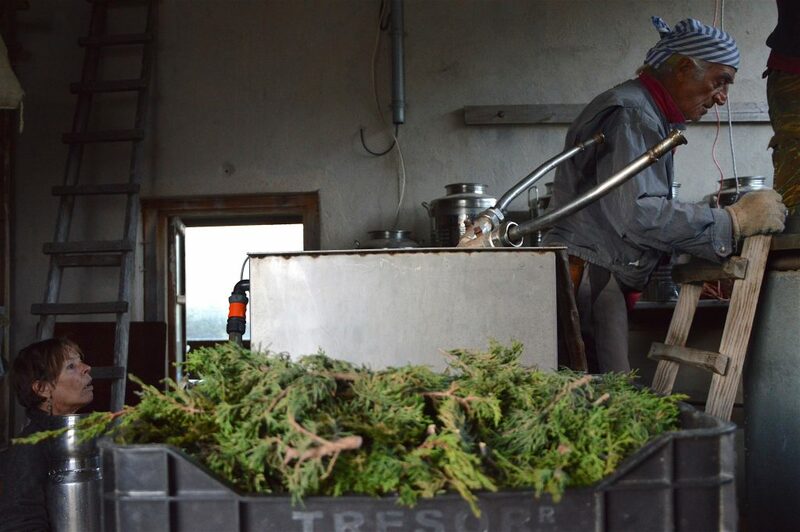 We cut the young leaves and green-golden-brown cones off the previously pruned branches and put them into our collection boxes in order to capture their fresh aroma during the distillation and reserve them in the form of essential oil and their hydrolat. 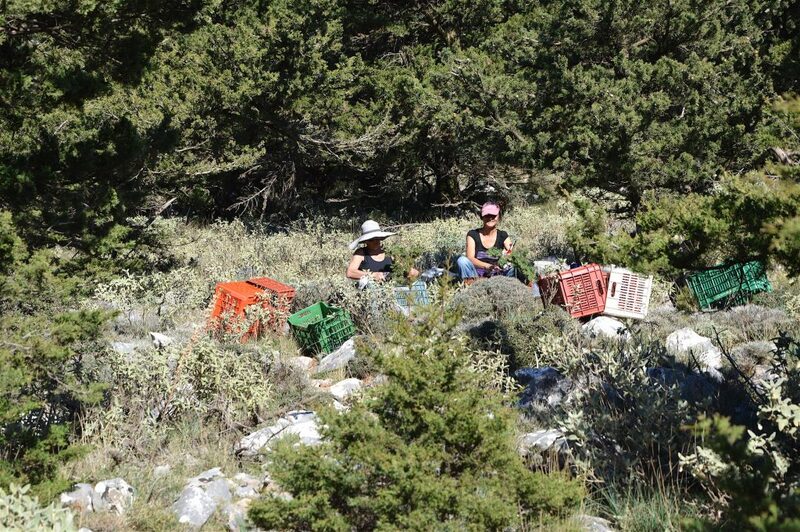 As the sun starts to go down, and gives us a last huge big hug through its magnificent wide shiny rays, we also descend on the hills carrying our boxes now full of our fresh cypress crop. Colours of our sunset rest on the rocks with artistic textures and brilliant lines. 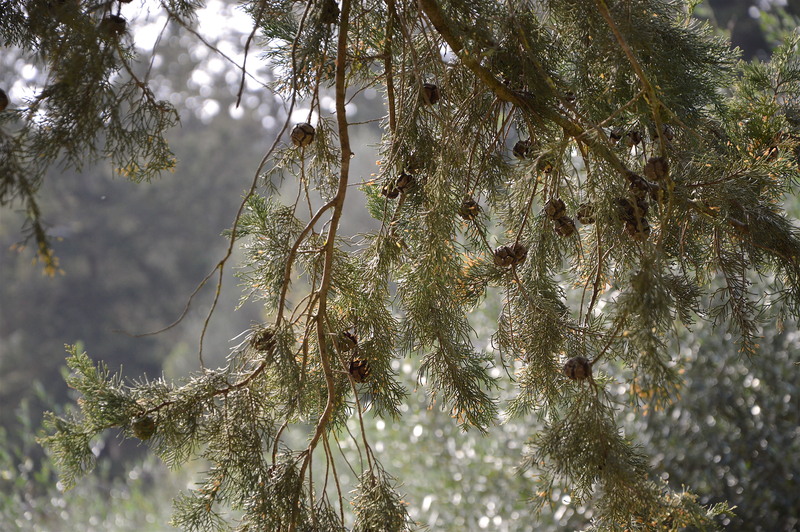 The essential oil of cypress is pale yellow or rather transparent with a balsamic, yet woody and fresh aroma. Main therapeutic features are relaxing, astringent and re-equilibrant and these aspects work well both on a physical and spiritual level. It is antispasmodic, and can be used well in cases of flu, bronchitis and asthma, even for children. Vasoconstrictor, regulates menstruation, relieves painful periods and is helpful in the menopause in all levels. 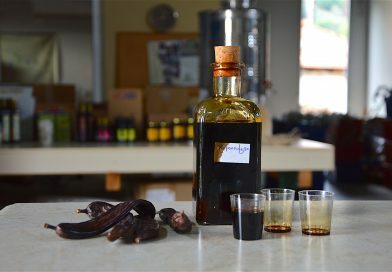 Also helpful in cases of edema, incontinence, excessive perspiration. In skin care it is especially useful for oily and over-hydrated skin and in cases of acne. Great tonic to the circulatory system and can be efficiently applied locally onto varicose veins and hemorrhoids. 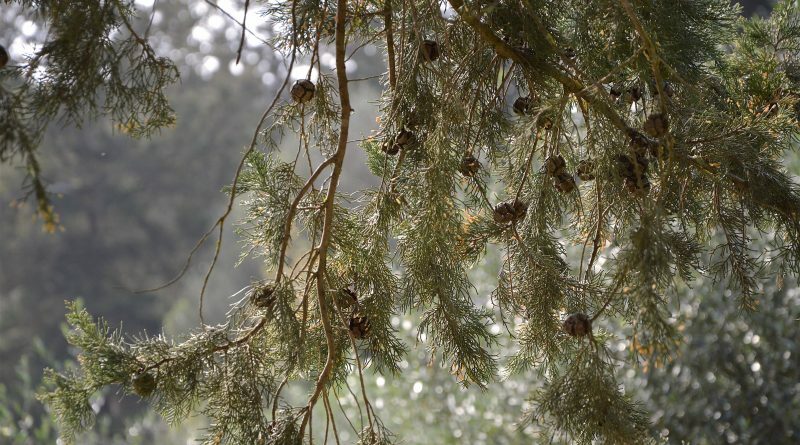 Cypress supports the nervous system, and as I mentioned in my introduction before, in crises of life its fragrance helps to cope with emotional difficulties, and to rise above self-pity and despair. As has its astringent effect on our physical body, so does it on the spiritual level: keeps us together when we are falling apart, and gives support and inner strength to pull ourselves together again. 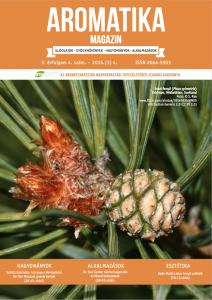 Monoterpenes: a-pinene (51%), Δ3-carene (17%), β-myrcene (2%), limonene (2%), α-terpinolene (2%), β-pinene (1%), δ-cadinene (0.8%), sabinene (0.8%), along with minor quantities of α-humulene, camphor, p-cymene, β-phellandrene and camphene (around 0.3%-0.4% each), and α-terpinene (around 0.2%). Esters: α-terpinyl acetate (4.5%), linalyl acetate, bornyl acetate (around 0.2% each).